Yep, you read it right! I’ve launched my “All Me-Made by the End of 2018” campaign and you can join all-in, a little, or just watch the progress. 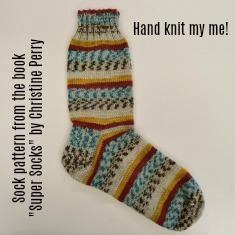 I’ll be posting my stories here starting with 1 1/2 Socks. These are my rules. My game, my rules, right? Everything that I wear will be handmade-by me-by the end of the year with the following exceptions. I’m keeping: my snow clothes, as they are mostly vintage and in great shape; the few pairs of hiking & athletic socks that I love and that are not trashed; hosery-this is not an exercise in suffering and I can’t knit my own tights, nor do I want to. Any new clothing that I bring into my life in 2018 will be me-made. This adventure is simultaneously an exercise in careful consumption. No stash building! Fabric purchases will have a specific purpose. A warm but casual coat with hood. 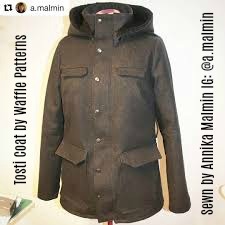 I’m planning the Tosti coat from Waffle Patterns. A good-fitting bra. Looking to the Orange Lingerie Marlboro Bra. Socks that don’t strangle my ankles. I have a tough time finding socks that are comfy! Right now I’m knitting socks with the help of the Winwick Mum! I love and wear jeans and tee-shirts in the winter and skirts and dresses in the summer. I buy fabrics on a whim and there is little theme to my style other than it has to be comfortable and washable. Never mind that my first make of 2018 is a the ultimate little black dress made from an exquisite black Armani wool and lined in rayon. Dry clean only, and don’t sit down, you’ll wrinkle your skirt! Ahhh, life is steeped in irony, isn’t it? Most exciting is the fact that I must learn some new skills to meet my goal. I need to learn how to make bras, underwear, socks. Gonna have to take a class and watch some videos and join some sew alongs! I have some ideas hatching and I’ll share them with you throughout the year. Soooooo, if learning to sew or improving your sewing are goals of yours for 2018, I’d sure love to help out. I teach sewing classes from beginning to advanced pattern fitting to mastering your serger. Making feels so good.